Faced with an abundance of pears from the tree in our yard, I began searching for a different way to use them. 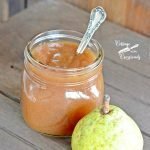 And this pear apple butter that I made turned out so darn delicious that I’m thinking that we need to plant a few more trees! Oh, my heavens, I am having trouble finding the words to tell you how wonderful this is! It is so good that I am already planning on making another batch just as soon as I can get to the store to buy more apples. 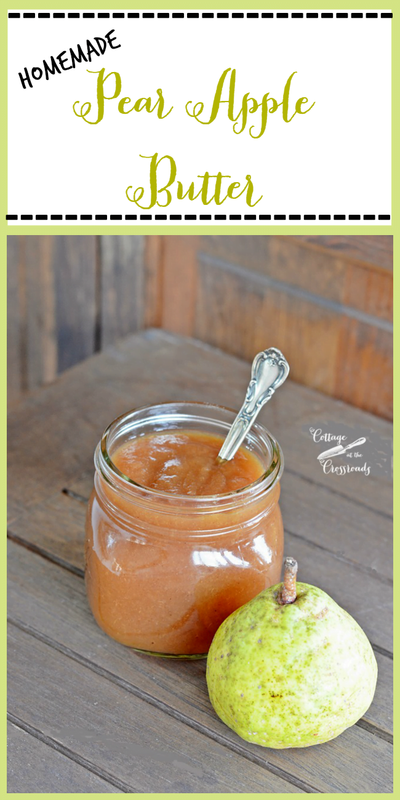 I will keep making this pear apple butter until I use up all these pears on our tree. Since we moved here, I’ve always wondered what variety these pears were. But I think I now know after reading a local newspaper column about pears. I’m pretty sure this is the Moonglow variety that has been widely planted locally since it has good blight resistance. 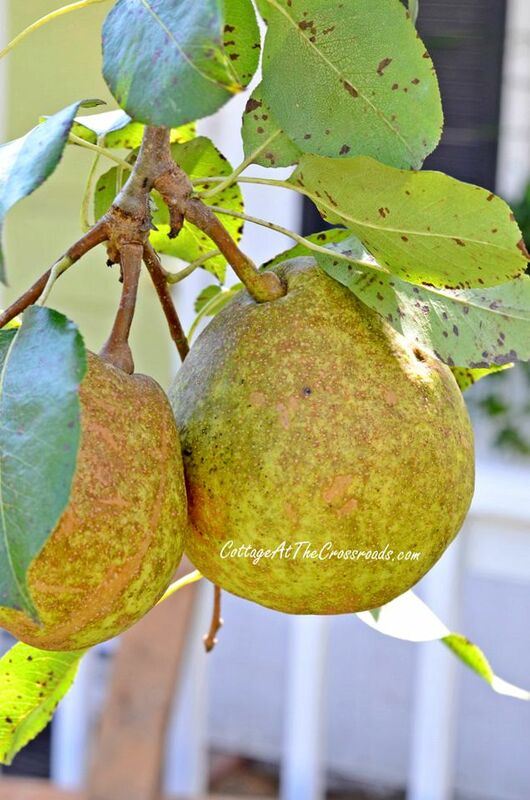 The pears that it produces are always delicious, and this year they have been HUGE! So large that I always think that if I was standing under the tree when one of them fell, it would knock me out cold! Fortunately, that has not happened. So in my quest to find a new use for the pears, I ran across a recipe in the new Fix-It and Forget-It Slow Cooker Magic cookbook (affiliate link) that the Good Book publishers sent me recently. The recipe was called “Festive Applesauce” and it called for a mixture of apples and pears. 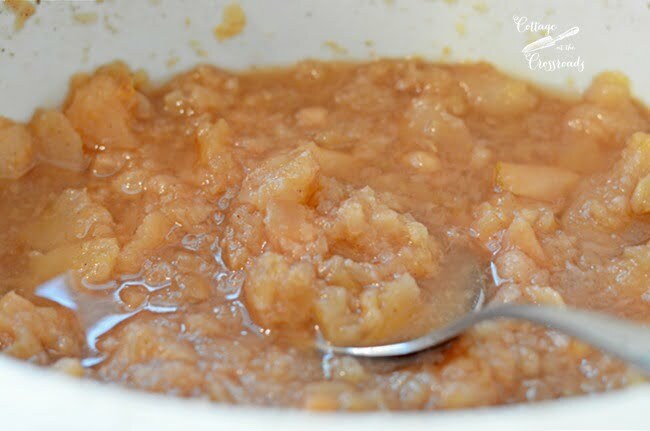 And since I had never made homemade applesauce, I decided to give it a try. After looking at many other similar recipes, I came up with my own version. By the way, if you are looking for some new recipes for your slow cooker, this cookbook is filled with so many awesome sounding recipes! 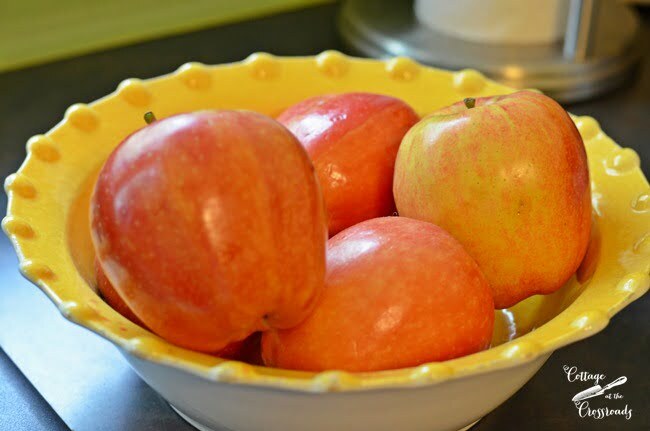 To make the pear apple butter, you will need 5 large apples. I don’t remember what variety I used, but you could use any cooking variety. Just peel, core, and chop them into large chunks. And you will need some pretty pears! I ended up using 8 of them because I was trying to clear them off my counter! Bartlett pears would work well in this recipe. Peel, core, and chop them as well. 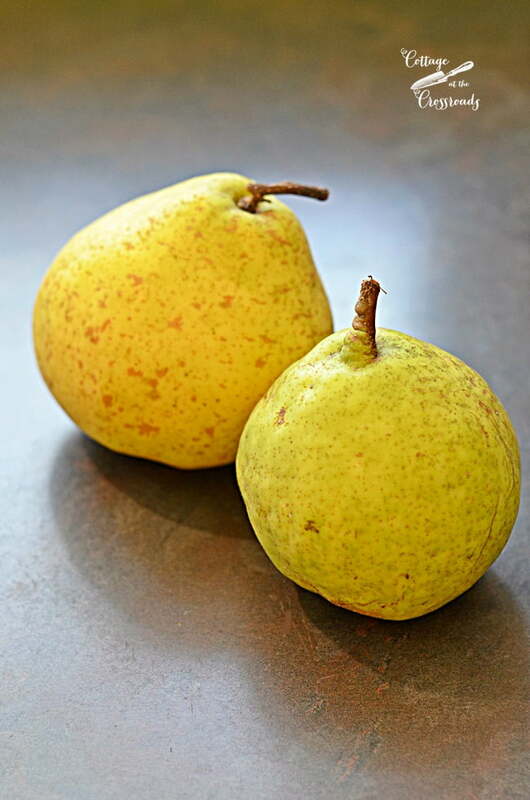 Throw the chopped pears and apples in a large slow cooker. I think mine is a 5 quart. Next I sprinkled some ground ginger, cloves, nutmeg, and cinnamon into the slow cooker and gave it a good stir. Now, can I admit a mistake that I made??? I knew that I should add some apple cider to the mix but I got confused and added about 1/4 cup apple cider VINEGAR! As soon as I added it, I realized my mistake but figured that I could correct it later. But isn’t it a funny thing about mistakes. The little bit of vinegar added a nice twang at the end and I would definitely recommend it! Hehe! Then I turned my slow cooker on HIGH and set it for 4 hours. About every hour or so, I would go in and give everything a stir, and this is how the mixture looked after cooking for that amount of time. After letting it cool down, I put it in the refrigerator overnight. The next morning, I put it in my food processor (in 2 batches) to make it smoother. You could use a blender to do this if you don’t have a food processor. To this mixture, I added 1 cup of light brown sugar, 1 cup apple cider, and 1/4 cup molasses. Since I wanted the mixture to cook down, I propped the top of the slow cooker open by using a wooden spoon and set it to cook for 4 hours on HIGH. At the end of that time, I didn’t think it was quite as thick as I’d like (I was aiming for more of a spread consistency rather than apple sauce) so I took the top off and cooked it for 2 more hours, stirring occasionally. And at the end of that time, I had a wonderful, dark brown, delicious butter! The volume had reduced by at least 1/2 and was nice and thick. I could hardly wait to spread it on some toast! Oh yum! It was twice as good as any apple butter that you can buy in the store! I ended up with 3 pint jars of the most wonderful spread that I’ve ever eaten. As the pear apple butter was cooking yesterday, the house was filled with the most wonderful smells of autumn. If you’re planning on making some of this butter, start early in the morning on a day when you can just wander in and out of the kitchen from time to time to give it a stir. Such a simple mix of ingredients that creates one of the tastiest things that I’ve had in a long time. If you give the jars as gifts, be sure to include directions to refrigerate and use the pear apple butter within 3 weeks. 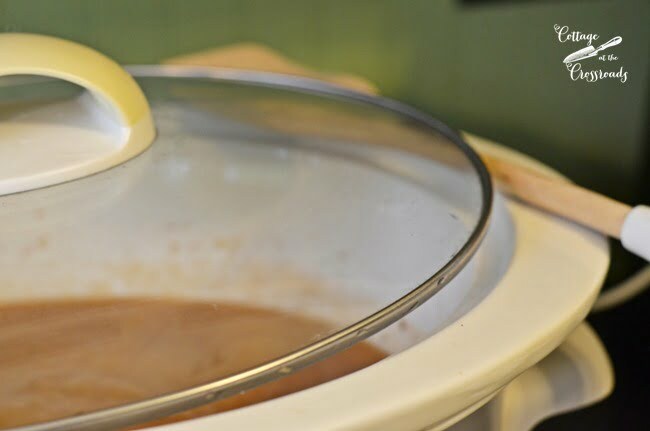 Put the chunks of pears and apples in a large, 5 quart slow cooker. Add the apple cider vinegar and the spices and stir to evenly distribute the spices. 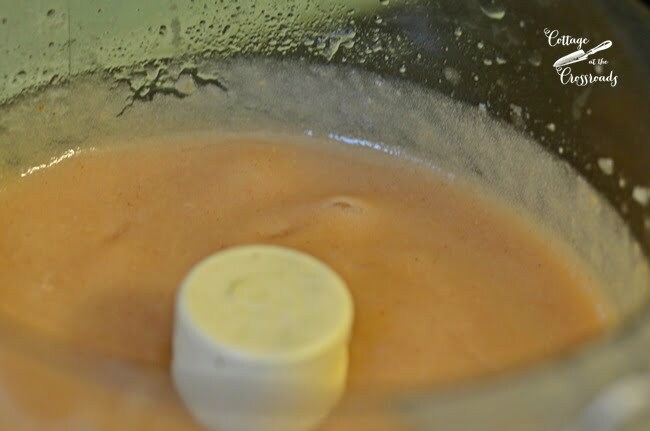 Allow to cool and then spoon the mixture (in 2 batches) into a food processor or blender and puree. Return the mixture to the slow cooker and add the brown sugar, molasses, and the apple cider. Stir to completely mix the ingredients. Cook on HIGH for 6 hours with the top propped open, stirring occasionally. Allow to cool before adding to glass jars. Don't be tempted to omit the molasses. It gives the butter a richer, smoky flavor! 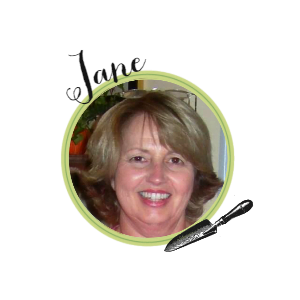 Thank you Jane. I made this and we absolutely love it. Thank you so much for coming back to give me your feedback, Mona! 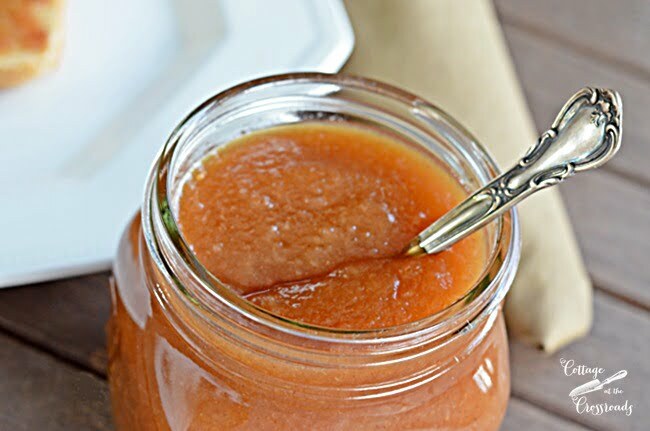 I have made several batches of the pear apple butter and now I’m thinking that I’ll make an applesauce cake with some of it. I’ll post the recipe if it turns out well. 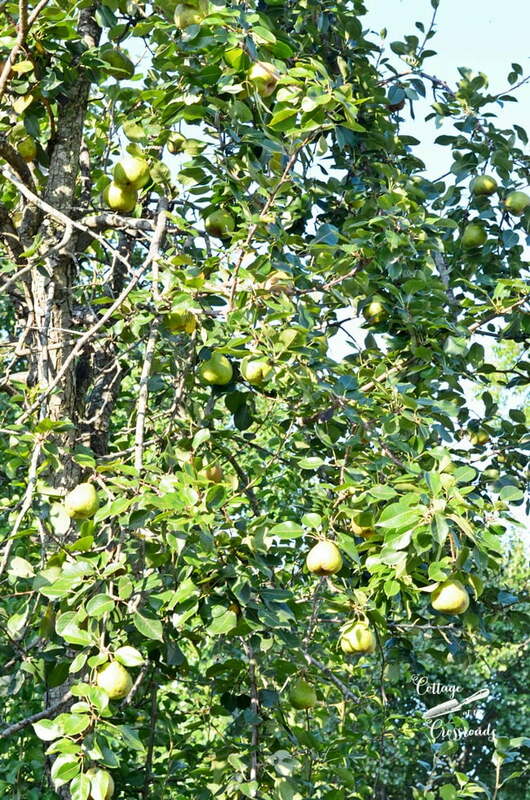 Oh how lucky you are to have a producing pear tree!! With our drought we have lost a couple of producing trees…an apple and a peach and a cherry. 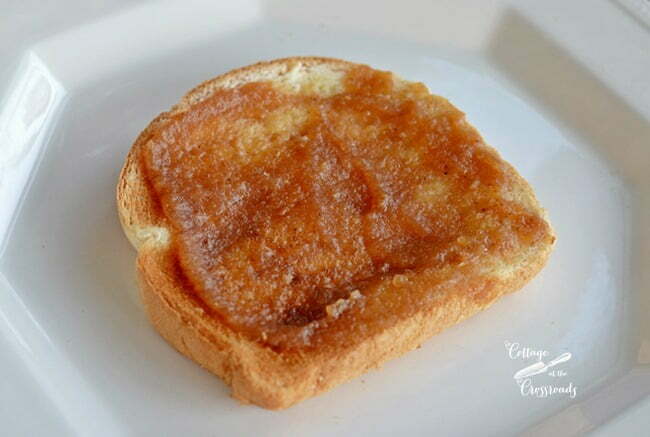 Your pear butter reminds me of the years I have made apple butter…..haven’t made pear butter, looks wonderful!! Thank you for reminding me of yummy Fall treats! How long did you process your next batch? I’m going to make this for sure, but want to keep it longer too. ???? This recipe sounds so good i just copied it off to try it. I am guessing you could make the recipe with just apples if you didn’t have any pears, so i might try it like that when I get some apples in, but either way it looks delicious. 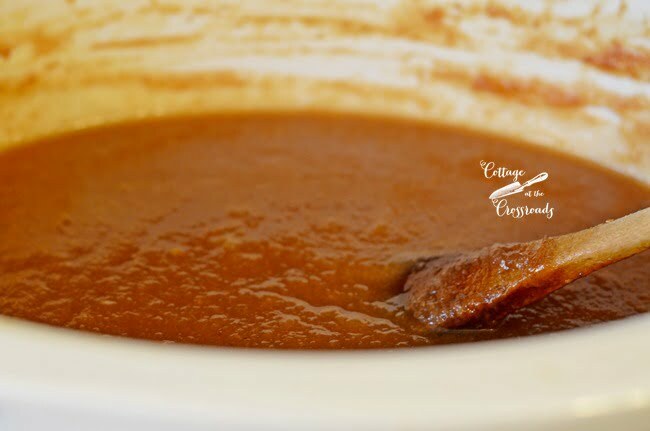 My mom always made apple butter every year or so but in those days I never paid much attention to how she did it except she cooked it for a long time. But I have a slow cooker so that makes it easier than having to keep an eye on it constantly cooking on top the stove. Thanks so much for the recipe! Jane this looks wonderful so I cannot wait to try some. The combination of apple and pear must be just perfect together. 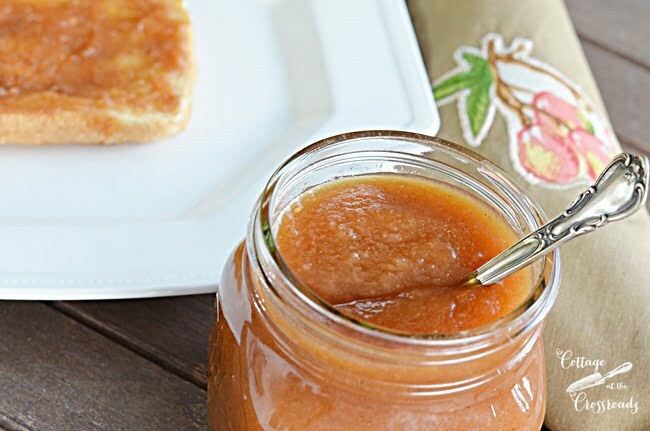 My favorite has been apple butter on toast or biscuits but it sounds like I will be making a change. Thanks for sharing. I just saved and am so glad to have this recipe. 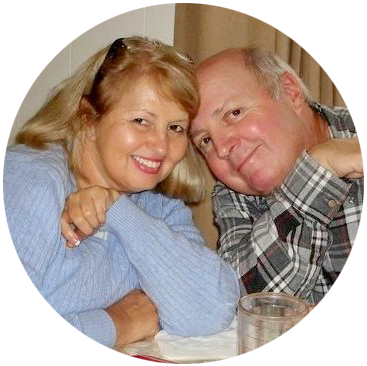 What a wonderful thing that happens when we make mistakes that turn out to be some of the best things we cook! This sounds so delicious but I was wondering if I could “can” this recipe so I could keep it longer? Patty, I was thinking the same thing. I think I’ll process the next batch so that I can save all this deliciousness! How long do you process this? I made it today and it’s delicious! ???? You are so lucky to have all your wonderfully grown fruits and veggies. This sounds so yummo! Have a great start to the new week ahead. 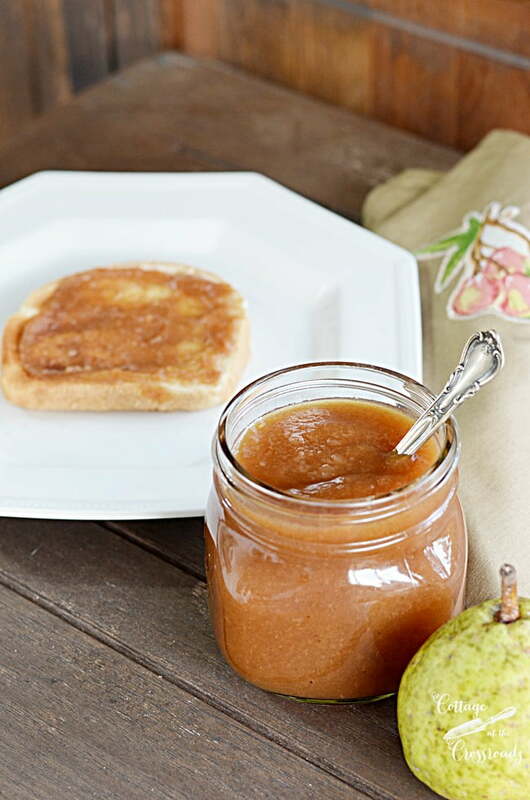 Love your Pear Apple Butter! Have a wonderful day!